Depending on your persuasion it could be a soccer ball, a gridiron ball but I’m actually thinking of an Aussie Rules ball. I don’t follow Aussie Rules. They probably have a name for their ball that isn’t just “football”, but I don’t know it. And I’m not about to ask Dr. Google. At least not today. The point being that it is no longer a beach ball and no longer a basketball. This morning I passed the 78kg mark. I’m very pleased with myself. I set an arbitrary goal of 75kg, and it’s within sight. Now I’m going to end this post before I find myself attaching a picture of my lunch. Rugby ball…. 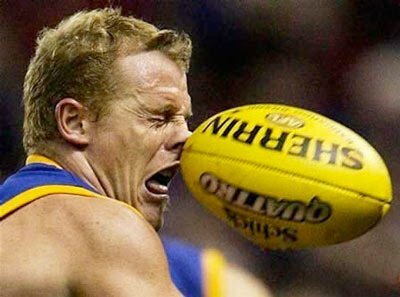 Aussie Rules…ball…. who cares, always looked like an egg to me and grown up man chasing it. Congrats on the weight… don’t show me the food you are eating, it’s the six-pack I am interested in.